Greetings, Faithful Readers! (All four of you! LoL) At the moment, your intrepid AVDawn is in sunny, muggy and sometimes rainy Orlando for Infocomm 2009. There is a LOT to report on, and as soon as I have five seconds to process everything and get my thoughts together, you’ll get it! If you simply cannot wait to get the AVDawn perspective on the show, check my live-from-the-show-floor updates on Twitter, @avdawn. If you aren’t a Twitter regular and want the live reports from ALL the Twitterers at Infocomm 09, go to Twubs.com and search for #ic09 – the official Infocomm 09 hashtag on Twitter. That will pull up all the tweets using the tag and give you lots of perspectives from the floor! And, in the meantime, here are some fun-fun-funnies to tide you over. Click on the graphic below to enlarge and read “AVDawn’s World” – a hopefully semi-regular look at AVDawn’s professional life at AVS. 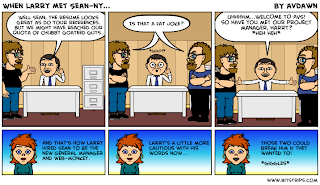 Every strip is based on a real incident that occurred at our company at one point or another. Enjoy them until the gush of post-Infocomm reports get posted! Cheers… and off to bed for me! Only one more day of sprinting about the massive show floor! The previous post should have said "now you have 5 readers"